Mailboxes are literally front and center in the home landscape and deserve thoughtful design so they are more than just a utilitarian feature. 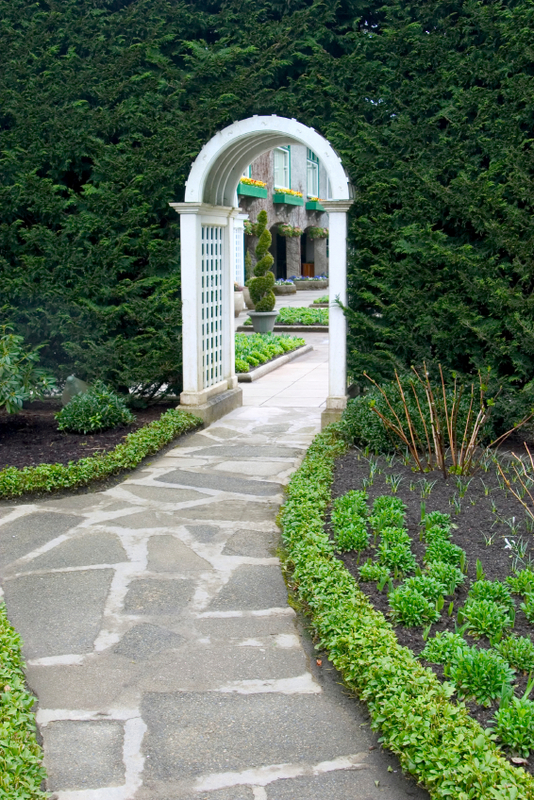 Spruce up this often overlooked area of the landscape. The flowers here were chosen for their complementary size and form and placed in a pleasing composition that completely fills the space, while keeping access open to the mailbox. The miniature rose bush is just the right height to conceal the post in front and a clematis climbs up a trellis to conceal it from behind. This soft blue mailbox is perfectly color-coordinated with a pink rose and purple clematis. At the same time, the white trim, red flag and orange daylily give a needed contrast without overpowering with cool color tones. Most mailboxes sit by themselves in a small island bed in the corner of the yard. This is a great example of how to integrate the mailbox with the overall design - simply by extending the bed to connect with other features in the landscape. There are so many ways to install a mailbox, besides simply erecting a post. This design incorporates the mailbox seamlessly within the fence column, so it doesn't stand out and take away from the gorgeous bougainvillea entryway to this stylish stucco home. This mailbox blends in by virtue of matching the architectural style of the home, brick for brick. This easy to do with new construction, but could also be employed creatively by custom building a mailbox to match the design of the existing home. A wooden mailbox looks like it is on its way back to nature, but is immensely charming in the process. Easter lilies, a hanging flower pot and a squash vine practically take it over, offering unconventional ideas for using the mailbox as a centerpiece in the landscape. There are many ways to keep a mailbox from standing all by itself and sticking out in less-than-gratifying ways. Vines and flowers make a nice backdrop, but most of these only look good about 6 months out of the year - unlike this stately dwarf pine tree, which keeps its graceful, deep green foliage year round. The mailbox is placed in a very refined, attractive container while also employing the simple beauty of evergreen foliage. This type of construction consists of an interior concrete core with a facade of natural stone. A flower-filled urn is a convenient way to bridge the space between the mailbox and plantings at ground level. The tulips look stunning here, but any selection of colorful annuals could be employed for the same effect. Change out the flowers every few months to keep the streetscape looking fresh. Try this great example of a 'quick-fix' mailbox landscaping project. Simply dig up the grass, place any stones or blocks you have on hand as a border, add a few inches of fresh topsoil for your favorite flowers and presto: you're done. There is a lot to be said for simplicity in garden design. A mass of white daisies with a solid green hedge in the background is the perfect complement to this unusual whitewashed mailbox. No matter what you come up with for sprucing up your mailbox environs, remember to step back and enjoy it each time you make a visit.